My first introduction to fairy bread was when I was traveling in Holland as a teenager. The youth hostels all served it for breakfast because it was popular with the Australian kids. I couldn’t believe that toast with butter and sprinkles was considered an everyday food. In my house my mother would’ve considered it a very decadent treat to only be eaten on one’s birthday. These days I make it for my kids on special occasions, and they love it. I don’t mind it too much so long as it doesn’t become commonplace. The last time I made fairy bread I made it as French toast. That worked well because I like my French toast nice and eggy with plenty of protein, so the sprinkles really just served as a garnish. I like to bake my French toast, so the sprinkles didn’t have to be fried at all. The kids love it. In fact, this is one way of eating fairy bread I can see becoming a little more frequent around here. I kick off my kids' birthdays with this AM treat. Step 1: Preheat the oven to 350 degrees F. Lightly oil a large rimmed sheet pan and set aside. Step 2: In a large mixing bowl, whisk the eggs, milk, vanilla, and cinnamon until frothy and smooth. Step 3: Dip the brioche in the egg mixture for about 1 minute, and then remove it, allowing excess to drip back into the bowl. Place the bread on the oiled baking sheet, making sure no slices are overlapping. Repeat with remaining slices. Step 4: Bake the French toast for 15 minutes, or until the tops of the bread are golden brown. Remove the toast from the oven, and immediately sprinkle the sprinkles over each bread slice, coating one side completely with sprinkles. Step 5: Carefully transfer the French toast to plates, drizzle with syrup, and serve. 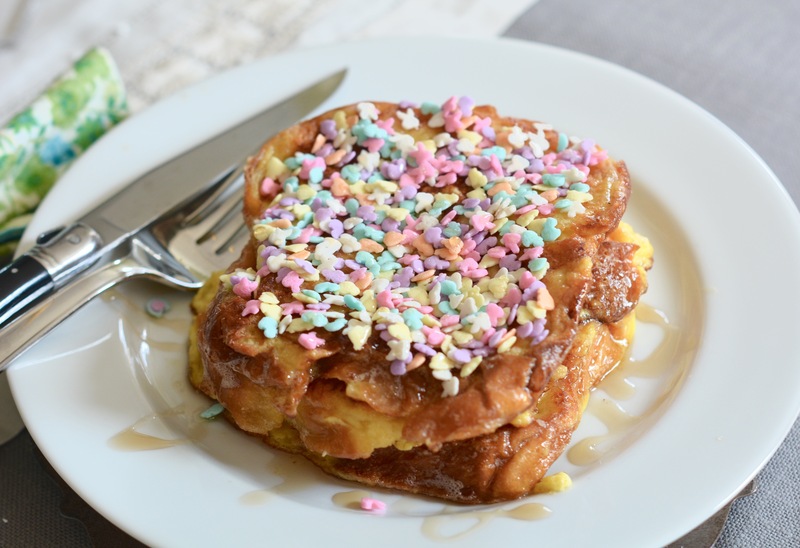 Easter Brunch Recipes for Adults & Babies, Too!